Beautiful Morocco…Art Deco buildings from Spanish era, Sidi Ifni beach, the foods…its endless. Sidi Ifni is some two hour’s drive from Agadir and is unique because of its much admired Spanish Art Deco buildings built when it was a Spanish enclave from 1934-1969. 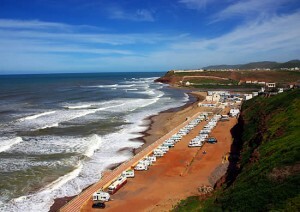 A vacation in Morocco’s Sidi Ifni on the shores of the Atlantic of Agadir is a great way to pass the summer months. 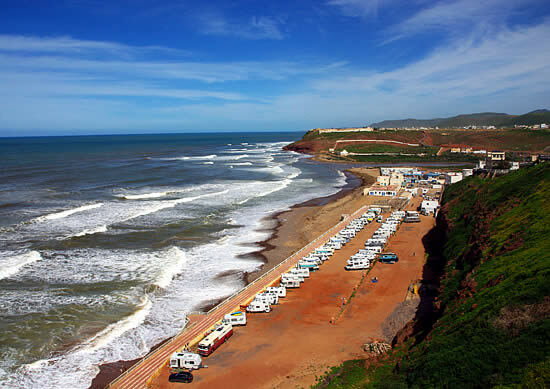 The cliff top views of the sea at Sidi Ifni and the beach are impressive. There are two buildings built like ships with portholes near the steps down to the beach and there is a striking lighthouse overlooking the sea. A former church now the law courts and a former Spanish consulate with its windows bricked up lie around the Place Hassan II, formerly Plaza de Espana along with the governor’s house which is now a royal palace. Previous Previous post: Live the life of a Greek shipping magnate!